At NuBoyana FX we are focused on providing top quality visual effects, animation and VR experiences for larger scale film productions, commercials and music videos. Our passionate team gathers people who have worked at some of the biggest and best VFX companies in the world. Because of that we are constantly on the lookout for new talent. The NBFX signature is a mix of creative thought, the latest of technology and a strong personal touch. We care for the people we work with, both inside and outside of the studio. 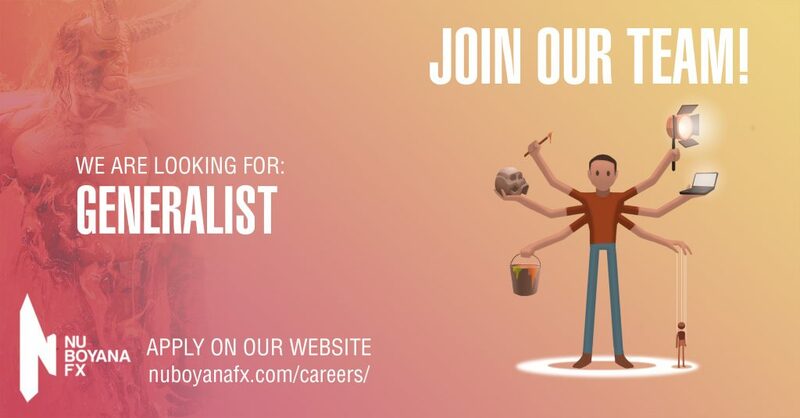 Nu Boyana Portugal is recruiting 3D Generalists. Are you ready to join a fast-growing team with new exciting projects to come? Generalists create photo-real environments and landscapes and exhibit a strong foundation in photo-realistic, traditional, and digital art skills with an emphasis on landscapes. They work with live action footage, digital still photography, rendered computer graphic elements, and digital paint to create environments that are seamlessly integrated into assigned shotwork. Texture skills would match this competence level, i.e. able to create maps in 2D and set up basic shaders for look development. Can respond to feedback to dial in the look of the element before handing to final comp. Accepted file types: doc, docx, pdf, jpg. If you were referred, please provide a name. Protection of the personal data you entrust to us is a priority for us. We undertake to only collect, store, process, share or delete personal data of applicants for advertised employment opportunities, with transparency and that such personal data is essential to provide the best services. We inform you how we use your personal data and for what purposes, with the assurance that we collect, share and store the data following the best practices in the field of security and personal data protection. When personal data are collected, stored, processed, shared or deleted by third parties or associates, we require the same level of privacy and security. Our purpose is for you to feel confident that your data is safe with us, as we will always be committed to protecting both your privacy and your personal data. II – Who is responsible for processing your personal data? NU BOYANA FX LTD, a company created under the Bulgarian law, with VAT Nº BG204505781 and headquarters at 1616 Sofia, 84 Kumatra Street, Boyana Film Center, Bulgaria; and NU BOYANA PORTUGAL, LDA., legal entity number 514 630 612, with headquarters at Avenida 31 de Janeiro, n.º 288, civil parish of São Victor, city of Braga (4715-052), are responsible for the processing of your personal data in accordance with the General Data Protection Regulation in force in the countries where they operate. III – What personal data can be collected? Data concerning the professional situation, for example: job title, professional status, name of the employer, type of contract, remuneration and qualifications. Any additional data which is deemed to be a legitimate right and interest, may also be collected. IV – Why do we collect your personal data and for what purposes? The personal data of the job applicants are used exclusively in the recruitment and selection process of future employees of NU BOYANA FX LTD and NU BOYANA PORTUGAL, LDA. However, job applicants may willingly make their personal data available for other purposes, such as receiving information about new job opportunities. V – How long will your personal data be stored? The personal data collected are processed in strict compliance with the applicable legislation and are stored in databases designed for this end. The personal data will be kept for the purposes identified in the previous point and up to 12 (twelve) months after the conclusion of the recruitment and selection process – unless the right to object, the right to erasure or the right to withdraw consent is exercised within the bounds set by law. VI – Whom we share your personal data with? NU BOYANA FX LTD and NU BOYANA PORTUGAL, LDA. may rely on third parties who have access to personal data of the job applicants. These third parties – subcontractors – may have access to personal data in accordance to the guidelines outlined by NU BOYANA FX LTD and NU BOYANA PORTUGAL, LDA. These subcontractors (third parties) are essentially partners and service providers, which include IT service providers, archive storage personnel and back office support. These companies shall ensure that such subcontracting parties provide sufficient guarantees for the implementation of appropriate technical and organisational measures so that the processing of data complies with the requirements of applicable law and ensures the safety and protection of the rights of data under the terms of the subcontracting agreement concluded with the subcontracting parties. UN BOYANA FX LTD and NU BOYANA PORTUGAL, LDA. may also share personal data of job applicants to third parties, in instances when such data communications are necessary or appropriate (i) under the applicable law, (ii) in compliance with legal/court orders obligations, (iii) to respond to requests made by public or governmental authorities, or (iv) when you have given us your consent. VII – What are the rights of the data subject? Right of access: the data subject shall have the right to obtain from the controller confirmation as to whether or not personal data concerning him or her are being processed, and, where that is the case, access to the personal data and the following information. Right of rectification: the data subject shall have the right to obtain from the controller the rectification of inaccurate personal data concerning him or her. The data subject shall have the right to have incomplete personal data completed. Right to erase: the data subject shall have the right to obtain from the controller the erasure of personal data concerning him or her. This right shall not apply to the extent that processing is necessary for compliance with a legal obligation. Right to restriction of processing: the data subject shall have the right to obtain from the controller restriction of processing of his/her personal data, including the right to request a full restriction on processing or limit the processing of data to certain categories or purposes. Right to data portability: the data subject shall have the right to receive the personal data concerning him or her, which he or she has provided to a controller, in a structured, commonly used and machine-readable format and have the right to transmit those data to another controller without hindrance from the controller to which the personal data have been provided. Automated individual decision-making, including profiling: the data subject shall have the right not to be subject to a decision based solely on automated processing, including profiling, which produces legal effects concerning him or her or similarly significantly affects him or her. The data subject shall have the right to withdraw his or her consent at any time, by means of any of the rights outlined above or in instances where the consent was given through an online form, the consent may be withdrawn by the same means. However, the withdrawal of consent shall not affect the lawfulness of processing based on consent before its withdrawal. – Postal Address: 1616 Sofia, 84 Kumatra Street, Boyana Film Center, Bulgaria. – Postal Address: Avenida 31 de Janeiro, n. º 288, parish of São Victor, city of Braga (4715-052). VIII – How are personal data protected? NU BOYANA FX LTD and NU BOYANA PORTUGAL, LDA. are committed to ensuring the confidentiality, protection and security of applicants’ personal data by implementing appropriate technical and organisational measures to protect their data against any form of undue or unlawful processing and against any accidental loss or destruction of such data. To that end, these companies operate using systems designed to ensure the security of personal data processed, creating and updating procedures to prevent unauthorized access, accidental loss and/or destruction of personal data, by committing themselves to complying with the relevant legislation to the protection of personal data of applicants and to process such data only for the purposes for which it was collected and to ensure that such data is processed with appropriate levels of security and confidentiality. Extra equipment for the storage, processing and sharing of personal data, in order to avoid downtime and unreachable data.